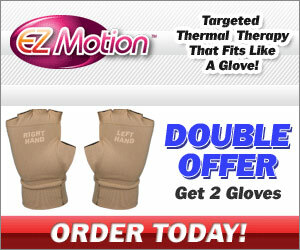 EZ Motion is a targeted thermal therapy that fits like a glove. No more ugly braces that are uncomfortable and inconvenient. EZ Motion are form fitting and discreet. EZ Motion gloves are perfect for Typing, Sports, Crafts, Outdoor Gardening, Household Activities & Many More. For a limited time, buy 1 set and get another set for free!